Objective Glucose variability induces endothelial dysfunction and cardiac autonomic nerve abnormality. Here we compared the effects of mealtime insulin aspart and bedtime insulin detemir on glucose variability, endothelial function, and cardiac autonomic nerve activity among Japanese patients with type 2 diabetes. Research design and methods Forty hospitalized patients received either mealtime insulin aspart or bedtime insulin detemir treatment for 2 weeks. We assessed glucose variability indices, including M-value, SD of blood glucose level, and mean blood glucose (MBG) level. Flow-mediated dilation (FMD) of the brachial artery was measured as an index of endothelial function. Low-frequency power, high-frequency power, and the low-frequency to high-frequency power ratio (LF:HF ratio) derived via heart rate variability analysis using a Holter ECG were employed as indices of cardiac autonomic nerve function. Results M-values and MBG levels showed a considerably greater decrease in the insulin aspart group than in the insulin detemir group (p=0.006 vs p=0.001); no change in FMD was observed in either group. Daytime LF:HF ratio significantly decreased in the insulin aspart group but not in the insulin detemir group. Total insulin dose at endpoint in the insulin aspart group was significantly higher than that in the insulin detemir group (p<0.001). Conclusions Mealtime insulin aspart reduced glucose variability to a greater extent than bedtime insulin detemir in patients with type 2 diabetes. Despite the need for higher insulin doses, insulin aspart decreased daytime cardiac sympathetic nerve activity. These properties may subsequently help reduce cardiovascular risks. Glucose variability, cardiac sympathetic nerve activity, and endothelial function are widely accepted as surrogate markers of cardiovascular disease. The effects of rapid-acting insulin analog or long-acting insulin analog on glucose variability, cardiac sympathetic nerve activity, and endothelial function have not been studied. Mealtime insulin aspart treatment profoundly improved glucose variability, particularly by reducing postprandial glucose levels, compared with bedtime insulin detemir treatment. Despite the larger daily total insulin dose, mealtime insulin aspart treatment suppressed daytime cardiac sympathetic nerve activity compared with bedtime insulin detemir treatment. The present study highlights the previously under-recognized effects of mealtime rapid-acting insulin dosing on glucose variability and cardiac sympathetic nerve activity. Longitudinal studies are needed to determine whether the appropriate use of rapid-acting insulin analog may help reduce cardiovascular events. Type 2 diabetes is a progressive disease, and a considerable proportion of patients eventually require insulin therapy. Long-acting insulin analog treatment is recommended for patients who fail to achieve glycemic control with oral antidiabetic agents.1 Data pertaining to the effects of long-acting and rapid-acting insulin analogs on glucose profile in Caucasian patients with type 2 diabetes are widely available.2 3 Long-acting insulin analog treatment is widely accepted owing to its ease of handling, low risk for hypoglycemia and body weight gain, and slightly inferior or equal hemoglobin A1c-lowering effects compared with rapid-acting insulin analog treatment. In contrast, the clinical features of East Asian patients with type 2 diabetes are different from those of Caucasians; for example, East Asians with type 2 diabetes tend to show lower insulin resistance compared with Caucasians.4 This suggests that East Asians with type 2 diabetes may require less long-acting insulin analogs to suppress liver gluconeogenesis. Moreover, in our previous study of Japanese patients with type 2 diabetes, approximately half (52.5%) of those with hemoglobin A1c >8.4% achieved adequate fasting glucose levels (<120 mg/dL) through mealtime dosing of a rapid-acting insulin analog.5 These observations indicate that treatment with rapid-acting insulin analogs may perhaps efficiently improve postprandial and fasting hyperglycemia in East Asians with type 2 diabetes. Furthermore, given that glucose variability associated with postprandial hyperglycemia induces cardiac sympathetic nerve overactivity and endothelial dysfunction,6 7 glucose variability is widely accepted as a therapeutic target for prevention of cardiovascular diseases. The present study aimed to compare the effects of mealtime rapid-acting insulin analog treatment and bedtime long-acting insulin analog treatment on glucose variability, endothelial function, and cardiac autonomic nerve function among Japanese patients with type 2 diabetes. A total of 40 patients admitted to Kanazawa University Hospital between August 2010 and July 2012 were enrolled. The eligibility criteria were patients with type 2 diabetes aged ≥20 years with hemoglobin A1c ≥7.4%. The diagnosis of type 2 diabetes was based on the 2010 Japan Diabetes Society criteria.8 The exclusion criteria were as follows: (1) hypersensitivity or contraindication to insulin aspart or detemir; (2) present or history of diabetic ketoacidosis; (3) present or history of severe hypoglycemia; (4) severe infection or severe trauma presurgery/postsurgery; (5) treatment with insulin, dipeptidyl peptidase-4 inhibitor, or glucagon-like peptide-1) receptor agonist in the 4 weeks immediately preceding the study; (6) glucocorticoid treatment; (7) poorly controlled hypertension (systolic blood pressure >160 mm Hg or diastolic blood pressure >100 mm Hg); (8) severe retinopathy; (9) significant medical history and/or malignancy; (10) severe complications and conditions not suitable for the study (hyperosmolar hyperglycemic state or heart failure); and (11) pregnant or lactating women. The study is registered with the University Hospital Medical Information Network (UMIN) Clinical Trials Registry (trial registration number UMIN000008369). Using a computer-generated sequence, patients were randomly assigned to receive either insulin aspart (Novo Nordisk A/S, Bagsvaerd, Denmark) thrice daily before meals or insulin detemir (Novo Nordisk A/S) once daily at bedtime. Sulfonylureas and glinides were discontinued after treatment assignment, whereas other hypoglycemic agents remained unchanged. Insulin therapy was initiated after an initial assessment. Physicians performed daily insulin dose titrations to achieve the glycemic goal. In the insulin aspart group, target prandial blood glucose levels were 70–110 mg/dL, whereas target postprandial (2 hours after a meal) blood glucose levels were 70–140 mg/dL. The target fasting blood glucose levels were between 80 and 110 mg/dL in the insulin detemir group. Blood glucose levels were measured using a blood glucometer (Glutest Neo Super, Sanwa Kagaku Kenkyusho, Aichi, Japan) at seven different time points: prebreakfast, postbreakfast, prelunch, postlunch, predinner, postdinner, and at bedtime (ie, at 07:00, 09:00, 12:00, 14:00, 18:00, 20:00, and 22:00, respectively). Patients were placed on a regular hospital diet (30 kcal/kg ideal body weight comprising 50%–60% carbohydrate, 20%–30% fat, and 15%–20% protein). where BGt is the blood glucose level at each time point; Gmax is the maximum blood glucose level throughout the day; and Gmin is the minimum blood glucose level throughout the day. Flow-mediated dilation (FMD) of the brachial artery was assessed with reference to guidelines.13 14 Patients were asked to rest in a supine position for at least 10 min. The brachial artery diameter of their right arm was measured by a single sonographer using a Doppler ultrasound system. A blood pressure cuff was inflated around the right forearm to occlude the brachial artery for 5 min. The brachial artery diameter was measured again at 1 min after releasing the cuff. FMD of the brachial artery was calculated as the percentage change in the diameter from baseline to that at 1 min after cuff deflation. The examination was performed mainly between 16:00 and 18:00, before dinner. All variables are expressed as mean and SD. Measures of heart rate variability were natural log-transformed to adjust for skewed distribution. Paired t-test or Wilcoxon’s signed-rank test was performed to assess the intragroup differences from baseline. Analysis of covariance with baseline variables as covariates was used to compare changes in variables from baseline. Pearson correlation analysis was used to explore associations between variables. All analyses were performed on the full analysis set. Data were analyzed using the IBM SPSS Statistics V.20.0 software. A two-tailed p value <0.05 was considered statistically significant. Eighteen and 20 patients in the insulin aspart and insulin detemir groups, respectively, were included in the analysis. One patient in the insulin aspart group withdrew consent after assignment, while another dropped out of the study owing to protocol violation (online supplementary figure 1). Baseline characteristics did not significantly differ between the two groups (table 1). Approximately half of the patients in both groups showed CVR-R of less than 2%, which is suggestive of diabetic autonomic neuropathy. Sulfonylureas were administered in two and five patients in the insulin aspart and insulin detemir groups, respectively. In these patients, insulin treatment was started at least 3 days after cessation of sulfonylurea therapy. Blood glucose profiles at baseline were similar in both groups (figure 1A,B). A significant decrease in blood glucose levels at all time points was observed in both groups after 2 weeks of treatment. Postlunch, postdinner, and bedtime blood glucose levels at endpoint were markedly lower in the insulin aspart group than in the insulin detemir group (figure 1C). Nadir fasting blood glucose levels with mealtime dosing of insulin aspart and bedtime dosing of insulin detemir were roughly similar (121.8±23.6 mg/dL vs 106.2±22.9 mg/dL; p=0.063). M-values and MBG levels in the insulin aspart group were considerably lower than those in the insulin detemir group (table 1). A similar reduction in the SD of blood glucose levels was observed in both groups. The seven-point blood glucose profile at baseline and endpoint in the insulin aspart group (A) and insulin detemir group (B). The seven-point blood glucose profile at endpoint in the insulin aspart and insulin detemir groups (C). Data are expressed as mean±SD. *P<0.05 for comparisons between baseline and endpoint. †P<0.05 for comparisons between the insulin aspart and insulin detemir groups. FMD of the brachial artery was assessed in 14 and 15 patients in the insulin aspart and insulin detemir groups, respectively. No significant change in FMD was observed in either of the groups after 2 weeks of treatment (table 1 and online supplementary figure 2). Changes in FMD during the 2-week treatment period did not correlate with changes in M-values, MBG levels, and the SD of blood glucose levels (data not shown). Cardiac autonomic nerve function was assessed in 13 patients each in the insulin aspart and insulin detemir groups. After 2 weeks of treatment, the 24-hour LF and HF power decreased, whereas the 24-hour LF:HF ratio remained unchanged in both groups (table 1). Careful observation of each time point (figure 2) revealed a significant decrease in the daytime LF:HF ratio in the insulin aspart group (figure 2E) but not in the insulin detemir group (figure 2F). At endpoint, the HF power from 12:00 to 13:00 in the insulin aspart group was significantly higher than that in the insulin detemir group (online supplementary figure 3). Consistent with this finding, the LF:HF ratio from 12:00 to 13:00 in the insulin aspart group was considerably lower than that in the insulin detemir group. Diurnal variations in low-frequency power at baseline and endpoint in the insulin aspart group (A) and insulin detemir group (B). Diurnal variations in high-frequency power at baseline and endpoint in the insulin aspart group (C) and insulin detemir group (D). Diurnal variations in low-frequency to high-frequency power ratio at baseline and endpoint in the insulin aspart group (E) and insulin detemir group (F). Data are expressed as mean±SD. *P<0.05 for comparisons between baseline and endpoint. Body mass index and serum levels of aspartate aminotransferase, triglycerides, total cholesterol, and high-density lipoprotein (HDL) cholesterol decreased only in the insulin detemir group (table 1), whereas neutrophil count, γ-glutamyltransferase, and LDL cholesterol showed a similar decrease in both groups. 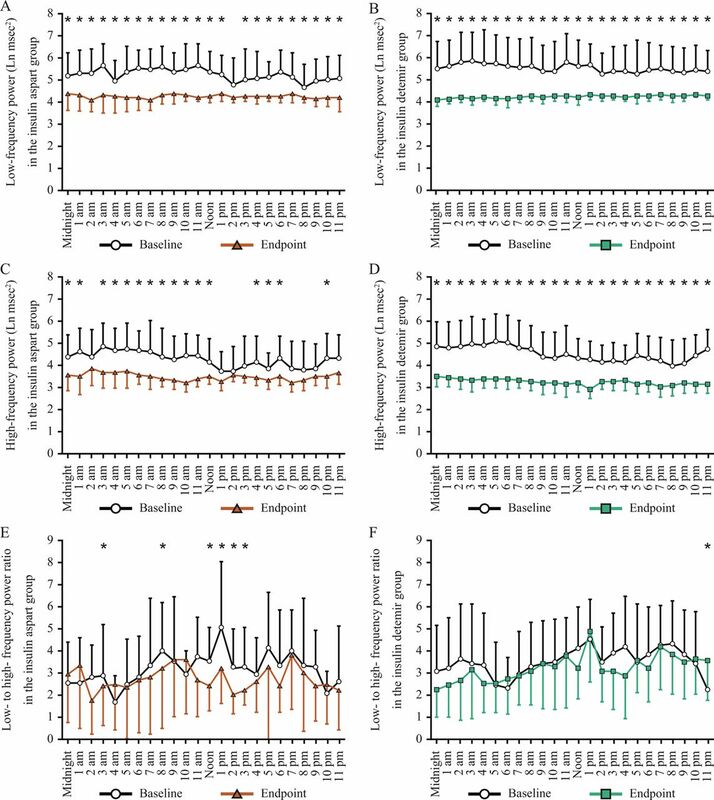 Morning basal energy expenditure and respiratory quotient were assessed in 15 and 17 patients in the insulin aspart and insulin detemir groups, respectively. The basal energy expenditure did not change even after the 2-week treatment in both groups. After treatment, the respiratory quotient significantly increased in the insulin detemir group but not in the insulin aspart group. Hypoglycemic events (blood glucose levels <70 mg/dL) were observed in three and one subject in the insulin aspart and insulin detemir groups, respectively (table 1). Hypoglycemic events occurred at prelunch, postlunch, or at bedtime in the insulin aspart group but only at prebreakfast in the insulin detemir group; these events did not occur just before or during the examination of endothelial function or cardiac autonomic nerve function. None of the hypoglycemic events were severe and all were immediately reversed with oral carbohydrate intake. Total insulin dose at endpoint in the insulin aspart group was significantly greater than that in the insulin detemir group (table 1). Moreover, the total insulin dose tended to positively affect changes in body mass index in the insulin aspart group (r=0.457; p=0.056) but not in the insulin detemir group (r=0.008; p=0.972). Correlation between the total insulin dose at endpoint and baseline characteristics was then investigated in each group (online supplementary table 1). The total insulin dose at endpoint showed a positive correlation with the baseline hemoglobin A1c level (r=0.528; p=0.024), fasting plasma glucose level (r=0.637; p=0.004), white cell count (r=0.492; p=0.038), and neutrophil count (r=0.620; p=0.006) in the insulin aspart group, and with the baseline fasting plasma insulin level (r=0.530; p=0.016), HOMA-IR (r=0.510; p=0.022), and HOMA-β (r=0.481; p=0.032) in the insulin detemir group. The present study indicated that both insulin aspart and insulin detemir significantly decreased the M-values and MBG levels. Insulin aspart prominently decreased the postprandial blood glucose levels, particularly after lunch and dinner and at bedtime, whereas insulin detemir decreased prandial and postprandial blood glucose levels almost uniformly. Reduction in the SD of blood glucose levels was thought to be caused by insulin aspart and not by insulin detemir treatment. Notably, equivalent nadir fasting blood glucose levels were observed after mealtime dosing of insulin aspart and bedtime dosing of insulin detemir. This finding is consistent with that of our previous study wherein mealtime dosing of a rapid-acting insulin analog was shown to achieve adequate nadir fasting plasma glucose levels in approximately half of the study population comprising Japanese patients with type 2 diabetes.5 In the aforementioned study, impaired insulin secretion and excessive glucagon secretion affected the nadir fasting plasma glucose levels after mealtime dosing of the rapid-acting insulin analog. In addition, patients with type 2 diabetes who had longer disease duration and inadequate control with sulfonylureas did not achieve adequate nadir fasting plasma glucose levels. Indeed, in the present study, only seven subjects used sulfonylureas (18.4%) at baseline. Consistent with the findings of the 4-T and APOLLO (A Parallel design comparing an Oral antidiabetic drug combination therapy with either Lantus once daily or Lispro at mealtime in type 2 diabetes patients failing Oral treatment) studies,2 3 insulin aspart treatment required higher insulin doses to achieve fasting blood glucose levels comparable with those achieved with insulin detemir. In addition, the final insulin doses in the insulin detemir group were roughly half of those in the insulin aspart group, whereas these were almost similar in the 4-T and APOLLO studies.2 3 These findings support the possibility that Japanese patients with type 2 diabetes, representing East Asians, require lower doses of long-acting insulin analogs to suppress hepatic glucose production than Caucasian patients with type 2 diabetes. Short-term intravenous insulin infusion using a hyperinsulinemic-euglycemic clamp was shown to shift the cardiac autonomic nerve balance toward a sympathetic dominant state.17 18 However, the effects of chronic insulin treatment with either rapid-acting or long-acting insulin analogs on cardiac autonomic nerve function have remained unclear. Unexpectedly, the present study indicated that 2 weeks of insulin aspart treatment, but not insulin detemir treatment, shifted the daytime cardiac autonomic nerve balance toward a parasympathetic-dominant state. This finding is even more surprising considering the higher total insulin dose requirement in the insulin aspart group. A previous report showed that glycemic variability positively affects the cardiac sympathetic nerve activity.6 Therefore, chronic treatment with a rapid-acting insulin analog may suppress cardiac sympathetic nerve activity at least partially via correction of glycemic variability. In the present study, each insulin regimen had its unique effect on the metabolic profile and energy metabolism. As observed in the 4-T and APOLLO studies,2 3 both insulin regimens exerted beneficial metabolic effects on the serum levels of γ-glutamyltransferase, triglycerides, and LDL cholesterol. Moreover, we observed a reduction in body mass index only in the insulin detemir group; this finding is consistent with the results of the 4-T and APOLLO studies wherein daily dosing of a long-acting insulin analog was less likely to result in body weight gain than mealtime dosing of a rapid-acting insulin analog.2 3 Similar to the 4-T study, the present study found a decrease in HDL cholesterol in the insulin detemir group but not in the insulin aspart group. Bedtime insulin detemir treatment and not mealtime insulin aspart treatment increased the morning respiratory quotient. Insulin shifts the energy balance from a catabolic to an anabolic state by switching substrate oxidation from lipids to carbohydrates. Our findings corroborate those of a previous study wherein treatment with a long-acting insulin analog increased the morning respiratory quotient in subjects with type 2 diabetes.19 However, mealtime insulin aspart may have possibly increased the postprandial respiratory quotient. Patients with type 2 diabetes have higher basal energy expenditure compared with individuals without diabetes.20–22 One of the physiologic mechanisms therein includes increased energy consumption due to hepatic gluconeogenesis. Given that treatment with a long-acting insulin analog effectively suppresses hepatic glucose production, it can be presumed to also decrease the basal energy expenditure. Indeed, previous studies have shown that bedtime insulin detemir treatment for 223 or 4 days18 decreases the basal energy expenditure. However, in the present study, 2 weeks of bedtime insulin detemir treatment did not change the morning basal energy expenditure, a result that seemingly conflicts with those of previous reports. Further studies are therefore warranted to clarify the time-course changes in basal energy expenditure during insulin treatment. Mealtime dosing of rapid-acting insulin aspart reduced glucose variability to a greater extent and achieved similar nadir fasting blood glucose levels compared with bedtime dosing of long-acting insulin detemir in patients with type 2 diabetes. Despite the need for higher insulin doses, rapid-acting insulin aspart reduced daytime cardiac sympathetic nerve activity. These properties may subsequently help reduce cardiovascular risks. The present study sheds light on the previously under-recognized properties of mealtime rapid-acting insulin dosing and may trigger reconsideration of patient-centered insulin therapy. Heart rate variability. Standards of measurement, physiological interpretation, and clinical use. Task Force of the European Society of Cardiology and the North American Society of Pacing and Electrophysiology. Eur Heart J 1996;17:354–81.
. Twenty-four-hour energy expenditure in Pima Indians with type 2 (non-insulin-dependent) diabetes mellitus. Diabetologia 1992;35:753–9. Presented at Parts of this study were presented in abstract form at the 4th Scientific Meeting of the Asian Association for the Study of Diabetes, Kyoto, Japan, November 24–27, 2012 (PCS-16-5). Contributors TK and TT contributed to the study design, data collection, data analysis, and data interpretation, and drafted the manuscript. YT contributed to the study design and data collection. YI, KK, and HM contributed to the data collection. SK contributed to the study design and data interpretation. TT is the guarantor of this work, and as such had full access to all the data in the study and takes responsibility for the integrity of the data and the accuracy of the data analysis. Ethics approval This study was approved by the Ethics Committee of the Kanazawa University Hospital, Ishikawa, Japan, and was conducted in accordance with the Declaration of Helsinki.